Description: "Tree to 15 m tall. Stem puberulous, glabrescent. Leaves: stipules leafy, 1 cm long, acute; petiole 16-25 mm long, with prominent, wrinkled base; rachis 6-7 cm long; leaflets 3 pairs, opposite, elliptic, 4-7.5 cm long, 2.7-4 cm wide, rounded to shallowly retuse, penninerved and reticulate between, coriaceous, glabrous except puberulous abaxial midrib. Panicle axillary or terminal, 10-15 cm long; rachis pubescent; bracts 4 mm long; pedicels 2 mm long, 2-bracteate. Receptacle of calyx short; lobes 4, thick, 1 cm long, tomentose outside with yellowish hairs and a few, short, pubescent prickles in upper half, densely hirsute inside. Petal as long as calyx, appressed-tomentose on lower margins. Stamens: two 2 cm long with anthers c. 3 mm long; remainder c. 1 cm long and probably not fertile; filaments hairy at base, glabrous above. Pistil c. 22 mm long; ovary and base of style densely hirsute; stigma slightly enlarged. Pod broadly ovate, woody, 4-5 cm long, covered with robust prickles to 5 mm long, rusty-pubescent, glabrescent. Seeds 4, ovate, black" (Flora of Australia online). Habitat/ecology: In the Philippines (native): "in forest at low and medium altitudes and limestone ridges (ASEAN Tropical Plant Database [website now apparently defunct]). 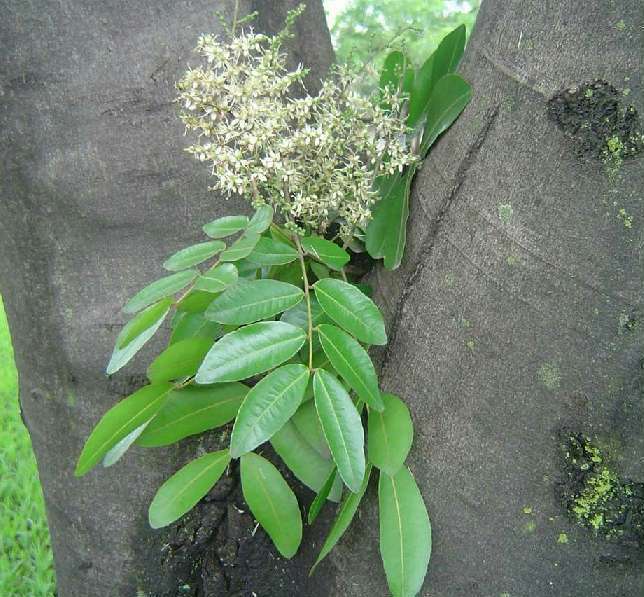 Native range: "Native to Tayabas Province, Luzon, Philippines" (Flora of Australia online). Possibly naturalised in northern Queensland. Control: If you know of control methods for Sindora supa, please let us know. This page was created on 2 OCT 2012 and was last updated on 9 MAY 2017.